Welcome to Year 1's page. We are a very happy, friendly and busy class and hope that you enjoy looking at some of the very many different things we are learning. Gymnastics. We have really enjoyed learning about different ways of moving and creating a sequence including a roll, a jump and a balance. Know your number facts! We have been working really hard to add teen numbers by making 10 and adding on. We have used ten frames and counters, worked with our partners and are using our mathematical words. 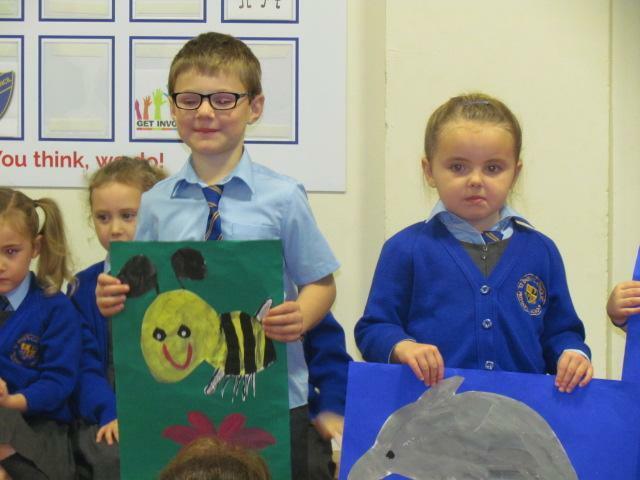 We were very proud and excited to share our class assembly with the whole school and all our mums and dads. 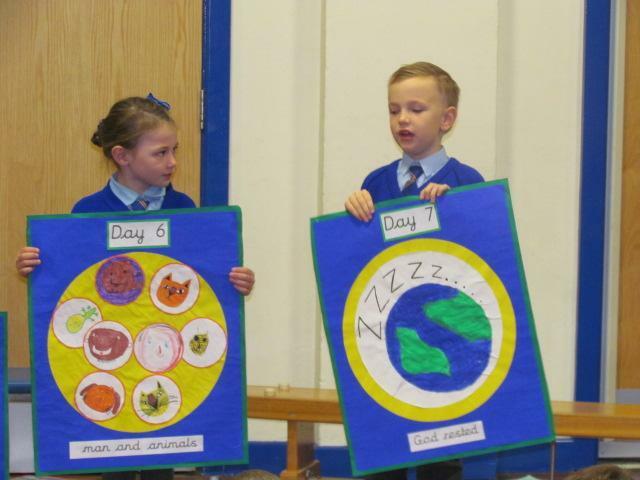 We shared all that we have been learning about the life cycle of a chick, Kandinsky, The Good Samaritan and our Lenten Promises. 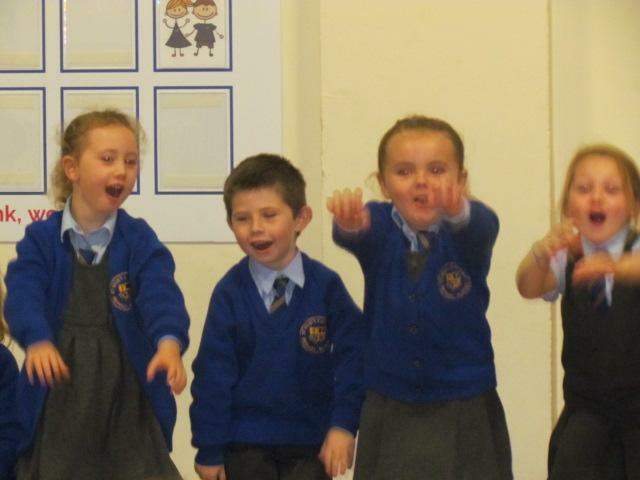 We spoke loudly and clearly and loved singing together at the end of the assembly! Another very busy and very special week. We have been learning about the life cycle of a chick. We watched every day in anticipation for the eggs to hatch. All in all 8 eggs hatched - Ash Wednesday, Moonlight, Sunshine, Fluffy, Rosie, Mr. Peep, Bob and Popcorn. Adam from "Living Eggs" came and took Mr. Peep back to the farm to help his leg get stronger, but all the rest are chirping happily in our classroom. We will miss them next week when they have gone. World Book Day. Can you spot some of your favourite characters? 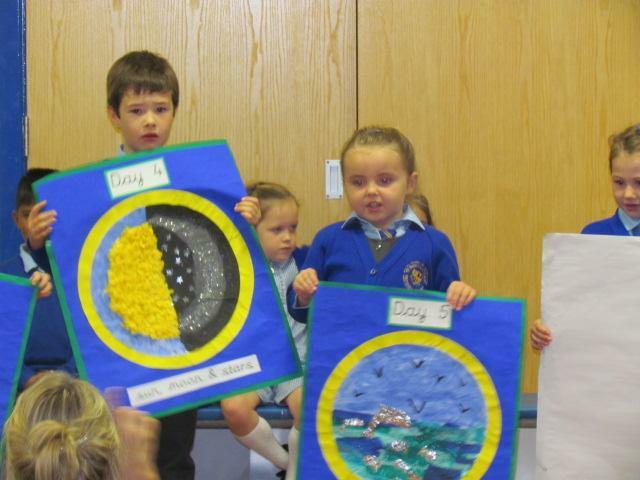 On Monday 4th March we had a very exciting delivery to Year 1. Ten little eggs in an incubator for us to look after. The Week A Dinosaur Trashed Our School! When we arrived at school following our half-term holiday we found that our school had been trashed. When Mr. Bowker and Mr. Robert had arrived early that morning they heard a noise coming from the hall which they then investigated. They found a T-Rex roaring through the hall. Mr. Bowker was pushed out of the way as he quickly took a film using his phone. The police arrived to make sure that school was safe. Oh what a mess! Our first job was to look around the school and work out just what had happened and then we had to tidy up to make our classrooms safe. 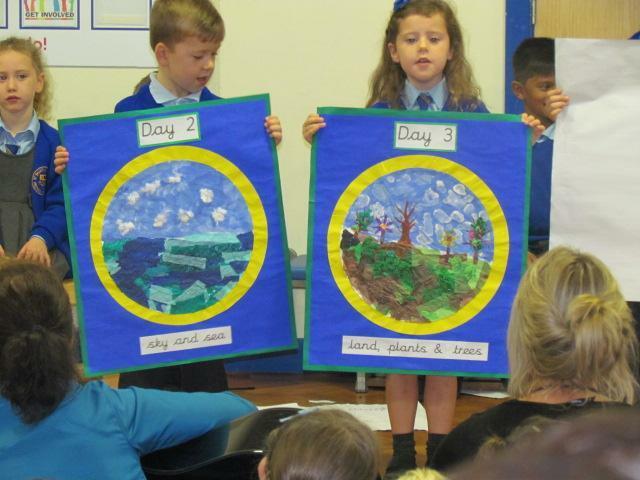 Look at some of the things we have been doing this week! Looking for fossils with Brian! In Year 1 we have been learning about primary and secondary colours and about mixing different shades by adding white or black. We listened to some music and drew what it made us think of and we have been learning about Kandinsky's abstract art. As part of our writing we have been really enjoying the book, "Supertato!" We had a "Superhero Day" where we came dressed as superheroes and had to complete five different challenges throughout the day. We had to complete superhero training completing an obstacle course as quietly as we could so we could practice our super sneaking! We had to free the animals that had been left frozen in the freezer by Evil Pea and find the 30 evil peas hiding in the classroom.... number 26 is still missing! We also had to design masks and safety cuffs to protect ourselves and our identities. In R.E. we are learning about being part of God's family, through the topic of "Families and Celebrations." 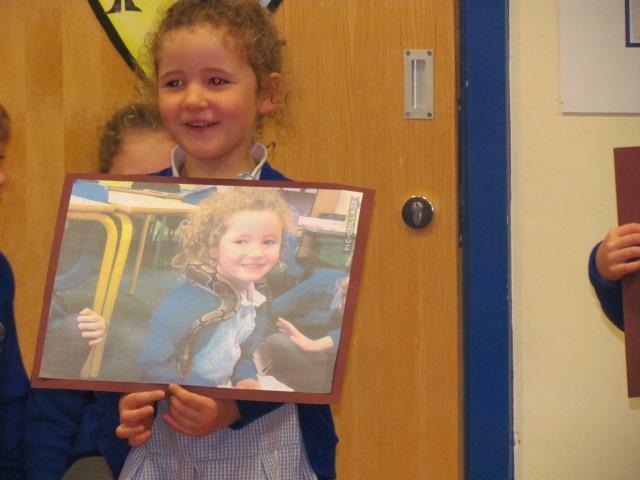 We have shared stories and photographs about special occasions that we have shared as families and we are learning about the signs and symbols of Baptism. 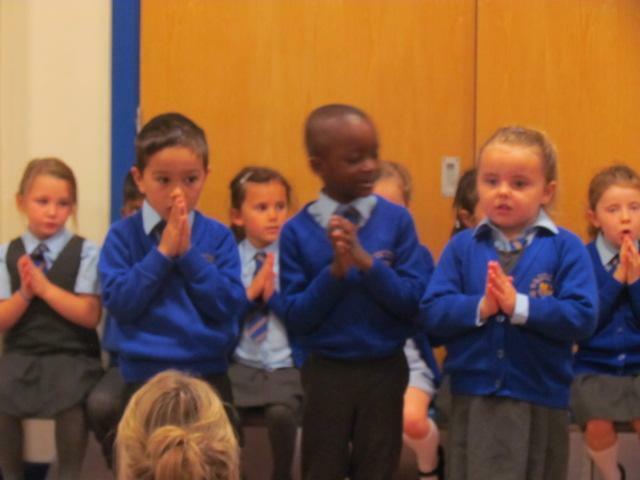 We went to church with Canon Tim and learned all about what happens at a baptism. we had to choose parents and God Parents as well as a name for the baby. We were very lucky when Phoebe's grandad came to visit us with some old toys from the time when he was a little boy. He showed us some dolls, a teddy and a dog called, "Buster!" He talked about the kinds of games he used to play with his friends outside and said that he did not have a television until he was 9! We talked about the differences between the new and the old teddy bear.
" Did Grandma and Granda have better toys than us?" We had to work with a partner to put together pieces of a jigsaw picture. We then had to try and work out what the picture was and describe it. They were all pictures of old toys and some of them were very peculiar! We are going to find out about and play some old fashioned games and make some old fashioned toys. For Enterprise week we have been thinking of something that people might like to buy for a Christmas treat. We got together with Year 2 and EYFS to work together - like a production line to make snowmen and Santa masks for selfie photographs! 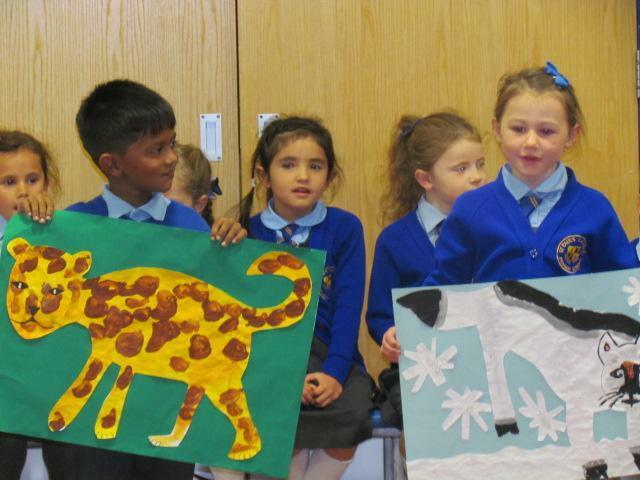 We really enjoyed working together and hope people come and buy them next week! To make the background of our Christmas cards we learned about colour mixing and how to make darker and lighter shades of blue. We will put a silhouette of the stable and Mary and Joseph with Baby Jesus, on the front. At the start of Advent, we made our Advent Wreath and learned about all the different parts of the wreath and what they each mean. We wrote our Advent promises and tried to think of ways that we can be more like Jesus and how we can put Jesus at the center of our Christmas preparations. Look at our lovely science wall. We have enjoyed looking at the work of Andy Goldsworthy. He creates a lot of his art by using things he finds in nature. He uses the colours, the shapes and the textures of natural objects. He does not use glue so his pictures will eventually change and even disappear. We copied some of his work and talked about what they made us think about. We also had a go at making pictures using autumn leaves, twigs, pinecones ad stones. As part of our learning about animals, we went into our school grounds to search for mini-beasts. We had to be very quiet in case we frightened them away. We looked under rocks and inside pipes, we looked under leaves and in the mud. We carefully brought back to class the creatures that we had found and had a closer look. Did you know that a woodlouse has 14 legs? After we had finished we returned all the creatures safely back to their homes. We are enjoying the challenge that comes with Power Maths! We have spent quite some time looking at numbers to 10. Exploring different ways to show numbers as well as comparing them by using good mathematical vocabulary such as greater than, less than, least and equals. We even made our own number lines! 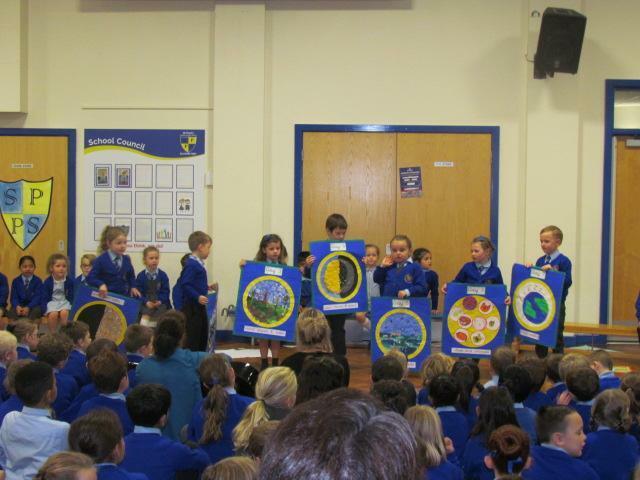 We were all so very proud of every single child in Year 1 today as they performed our class assembly. 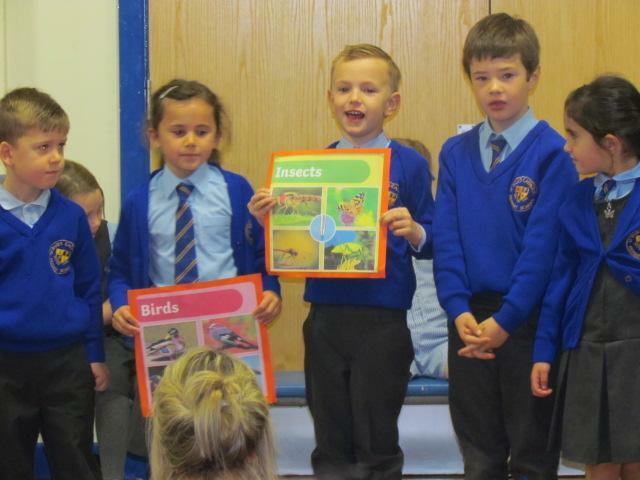 They shared lots of our learning about animals, showed our pictures, sang two songs and told the story of Creation! Visit from a vet. We were extremely lucky when Ariella's mum agreed to come in and chat to us about looking after animals. She talked about how she finds out what is wrong with an animal and showed us the special clothes that she wears if she has to do an operation. We were fascinated by the x-rays and the cat skeleton! Some of us had a go at putting a bandage on a paw and some of us did a quiz about the number of teeth different animals have. It was a brilliant visit and we found out new and interesting facts. Thank you Mrs. Connolly! To enrich our learning about animals, we had a visit from "Meet the Creature!" Dean brought in many different animals for us to learn about, to hold and to describe. Some of the animals he brought with him included a Royal Python, a chinchilla, a bearded dragon, a corn snake, a tortoise, a tarantula, a gecko, a stick insect, a giant snail and a frog. We asked questions and some of us held the different creatures. 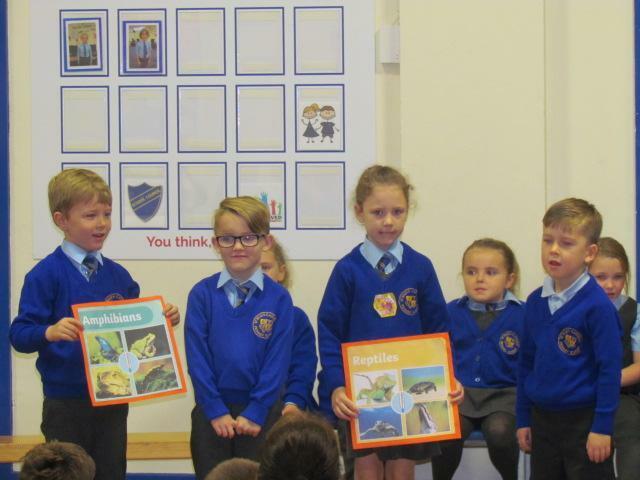 We also began to learn about the different animal groups such as amphibians and mammals. We have come back to school full of chat about our holidays and keen to see our friends again. We have spent quite some time thinking about our class rules and the things that we think will make our class a happy place for us all. We have enjoyed exploring our new classroom and are settling well into new routines. We have planted some pansies to enhance our outdoor space and we have painted pictures to brighten up our classroom. We also made a graph to show which area of learning we like best!